Has 40 recipes, 4 public recipes. Has 194 flavors in inventory. Manser80 supports All The Flavors. Upgrade yourself. 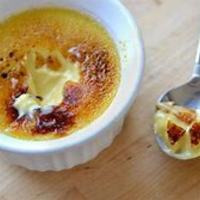 This is a very simple crème Brule base recipe it was designed for other mixers to be able to add and adapt to their own recipe. I think that its pretty enjoyable as it is but there is plenty of scope to be able to take this recipe in many directions to fit many different taste, personally I like it with some TFA toasted marshmallow and FW blueberry. Inw Crème Brule 2% This is obviously the star of the show here and it does that top crust note very well you can almost taste the crunch. Sadly the custard part does lack a little and that's where we needed to boost the recipe. Inw Custard 2% I choose inw custard over the usual cap v1 for many reasons the main one being steep time it develops so much quicker. Inw custard is thinner than a lot of the custards on the market but that's not always a bad thing and in this recipe it means that the crème brule top notes still shine through without getting drowned in thick richness of cap v1. However crème brule is a thick desert and to get that accuracy we needed still to add something else. CC Devon Cream 1.5% I love this concentrate and its my go to for many recipes and it pairs so well with inw custard. Its a thick, rich and buttery cream that gives the recipe that last bit that it lacked before. Devon cream is quite a strong concentrate and 1.5% is plenty to boost that custard note and still letting that crust layer from the crème brule to come through I find if you push it much past this that buttery note takes over and starts to taste greasy. Mix it as is or change it about, add fruits or boost those dark sugar note. Do it your way that's why we love Diy. This is not a clone more a tip of the hat to my favorite commercial juice. I got into mixing my own juices pretty soon after starting vaping so never really tried that many "premium" juices but this was one of the first I tried and it was a vice of mine for a long time. Mangabeys is a lovely rich sweet tropical mango and pineapple profile but when I say sweet its really sweet its a coil killer and I eventually got tired of having to rewick my coils everyday so I set about recreating my own version and here it is I hope you enjoy it as much as do. Cap Sweet Guava - it took my quite a while to realise that guava was such a key part of this recipe, I knew it was there but wasn't until I bumped it up did it really bring the recipe together. Flv Mango/Cap Sweet Mango - This is a great pairing of mangos together they give you everything you could possible want in a mango flavour. Rich, sweet, juicy and body its almost like actually biting into a really ripe mango. These are not the mangos that 12 Monkeys used in their Mangabeys but I love this combination. 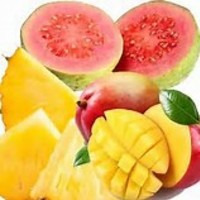 Tfa Pineapple/Tfa dragonfruit - Tfa pineapple is rich, sharp and very strong and if its not well balanced it can take over a recipe very easily and become harsh which is why I used Tfa dragonfruit. The dragon fruit has many uses here its used vey low so it dosnt impart a lot of flavour but it does help round out the top notes of Tfa pineapple and calm it down so it dosnt bully the other flavours in the recipe. It also gives the whole recipe a bit of extra juciness. Cap Super Sweet - Well this is a remix of a "premium" juice and to give it a little more of a "premium" taste it needs sweetener. At 0.5% I think it gives the profile all the sweetness it need to emulate the original but not gunk your coils too much it also helps lift all those flavours to the next level. 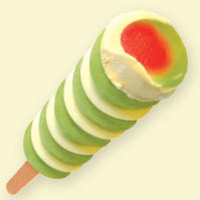 There are a few twister ice cream recipes out there some good some not so good, but every one I have tried I have always thought it could be better so this is mine and I hope you enjoy it as much as I do. With spring now appearing and the promise of summer on the horizon this is the perfect summer time vape. This is a thick and creamy ice cream base for all the other flavours to sit on top of. Its strong enough to be present through the vape but not overtake the whole recipe. TPA VBIC is my go to ice cream flavour so seemed like the obvious choice to start with and the addition of CC Devon Cream is a great supporting flavour to the VBIC and helps bring out that rich creaminess that is required and helps give the recipe that cream base for all the other flavours to cling onto. TPA Pineapple is a good flavouring for this recipe and I have tried a few in it. It has a good citrus sharpness that I wanted to have in this recipe but by itself it can be too sharp and can easily overpower a recipe and bully other flavours to sit behind it and I didn't want that so the addition of TPA Dragon Fruit helps round down the sharper notes and helps it sit nicely with the other citrus flavours. The other reason for the Dragon Fruit addition is it gives the whole recipe a bit of juiciness that you would expect from an Ice Lolly. FA Lime Tahity Cold Press is a fantasic flavour and one I use a lot, Its a lovely natural tasting lime that is a good pairing with the TPA Pineapples natural sharpness. The addition of CAP Italian Lemon Sicily was used because I felt the lime just needed a bit of a kick to help it sit more forward as I wanted sitting beside the pineapple. I used this strawberry because I my opinion this is the best strawberry out there. It has a good full flavour that can stand up to a lot of flavours and can handle a steep without fading. I tried pairing this with a few different strawberry options but to be honest I thought it worked better alone in this case and of course the addition of TPA Dragon Fruit also helped pad this strawberry out a bit anyway. I wanted this strawberry to be present but sitting more in the background like you were licking the lolly rather than taking a bite out of it. Now this is really down to personal taste but I really do think this recipe really does benefit from a touch of super sweet to give it a bit more sweetness against the sharp notes that in the recipe and helps just round the whole recipe together a bit more but this can be adjusted to your personal taste.